When you have an upcoming move, your children can have a difficult time handling it. 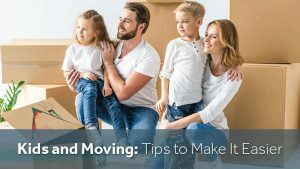 Use the following tips to help make moving with kids easier and much less stressful. Don’t wait too long to discuss your move. Children should know about it a month or so before it happens. This allows them to have enough time to cope with their feelings about the move and get ready for it. Explain to them that they’ll still have their current belongings, including their favorite toys. For younger kids, you can keep explanations brief, since they don’t understand what’s going on as much. Older kids will likely have more questions and concerns about the move, so be prepared to reassure them. You can help your kids feel more comfortable with the move by taking them to your new home or neighborhood if possible. This gives them a chance to explore their new surroundings so that they’re not completely new to them when you move. If you have the opportunity, you should take your children to visit their new school and meet the teachers and principal. Moving is a big change for kids. Give your children time to process their feelings about it, and let them cry if they need to. This prevents them from bottling up their emotions about the move and gives them a way to deal with them in a healthy manner. Even though moving is hectic, make an effort to follow your usual routine at home both before and after your move. Keep the regular meal, bath and bedtime schedule that your kids already follow. This can help them feel calmer and less anxious about getting used to a new home. 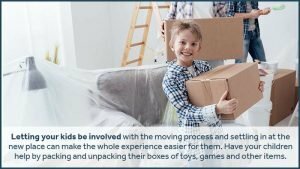 Letting your kids be involved with the moving process and settling in at the new place can make the whole experience easier for them. Have your children help by packing and unpacking their boxes of toys, games and other items. If they’re old enough, let them decide how they want their new room set up and where they want their items to go. Once you’ve brought all of your boxes and other items to your new home, get your children’s rooms set up first. This will provide them with a place to feel more comfortable, especially if they have the same bedroom furniture and all of their favorite toys with them. Keep in mind that it can take kids several weeks to fully adjust to living in a new home and going to a different school. If you need help moving in the Columbus area, contact us at Zippy Shell Greater Columbus for a free quote. We can help with all your moving and storage needs!